The Lower School readathon, Once Upon a Readathon, was a huge success! During this fairy tale-themed week of reading, students kept track of their reading minutes to move up levels around the library in the hopes of earning the “key to the castle.” Starting with a magical drawbridge, students had to move through a gingerbread house, enchanted forest, and Jack’s beanstalk before finally getting to the castle! Students who read ten hours received a real key. 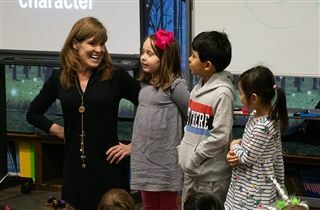 Throughout our readathon, lower school students and faculty enjoyed themed dress days, fairy tale decorations, a visit from author Katie Klise, and hearing many guest readers in their classes. Overall, Lower School logged an impressive 2,278 hours of reading! Great job, Bearcats! Here's a special shoutout to those students who read 20 hours or more: Zahra Tiwana, Sara Sison, Christopher Pisaryk, Parker Otter, Arjun Kakarlapudi, Eli Martin, Humza Tiwana, and Ava Cohen.